Last year I joined Quora a really interesting site with conversations about many things, including life in general. I really liked the analogy made between playing Chess and Life by Joe Blitzstein Professor in the Harvard Statistics Department. He has been playing chess for 25 years (his US Chess Federation Rating is about 2100, about midway through the Expert range), and his insights and analogies are interesting, at least to me. As I advocate for people with dementia, which obviously includes me, I continue to be astounded by those who are actively against this, even though they are passive in the way they behave against us. In a group recently, where the issue of there being an equal balance of membership with carers and people with dementia, one carer said, “But then who will do the work?” implying that the people with dementia in this group don’t do the work. It was openly insulting, and clearly highlighted the values of this person, and their lack of respect for us. I know for a fact the few of us in this group, with dementia, all contribute and work conscientiously and with passion; it is difficult to know who our enemies are, until things like this take place. The passive aggressive undercurrents are becoming clear, and it is definitely now time for change. It was once difficult to know who our enemies are, but this is definitely becoming clearer as we speak out more. How is chess similar to life? “This is an extremely open-ended question so let me just point out a few key similarities and differences. Similarities: the following considerations are essential for success. Planning for the future. Doing this well involves a mixture of strategy (long-term planning) and tactics (short-term calculations about how to achieve your goals). Time management. Time is a precious resource (which reminds me, I shouldn’t spend too long writing this answer…). In chess, time management is required both on the clock (when playing a timed game, as is always the case in tournaments) and on the board (the unit of time is called a tempo, and wasting tempi is a recipe for disaster). Pattern recognition. Both in life and in chess, reasoning well about complicated problems requires recognizing patterns, structures, and analogies, so that the situation can be chunked into simpler pieces and to make it easier to effectively use past experience. 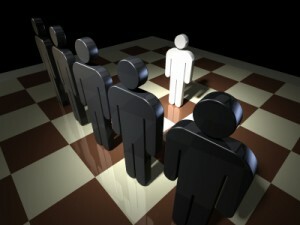 Differences: here are a few key differences between chess and life. Randomness. Chess does not involve rolling dice, flipping coins, or other stochastic components. Chess players do sometimes say things like “he got lucky” after a loss, but it’s debatable whether that is really luck. Life is suffused with randomness (which is a major reason that we need probability and statistics!). Hmmm… maybe I’ve got too much time on my hands, but I found this analogy and discussion really interesting!!! There were lots of people who made some really interesting comments to this piece, so consider joining Quora if you want to read more.